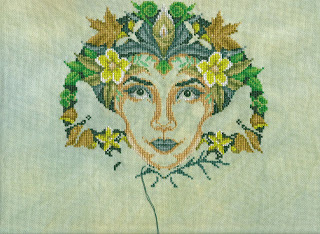 The Theme for January was Jardin Janvier, so I stitched Green Goddess. She is all leaves and flowers so most appropriate for the theme. I haven’t stitched on her since my update on the 23rd so the pic on the right hand sidebar of this blog is the latest one. The Theme for February is Fan Girl February. So of course Joan Elliott's Green Goddess will be top of the list! I also have a Just Nan Round Robin to stitch on and there's a Teresa Wentzler Dragon SAL on FB to celebrate the Year of the Dragon. I'm thinking of stitching one of the small freebies for that one. I really should stitch a Nora Corbett just to complete my quartet of Favourites. 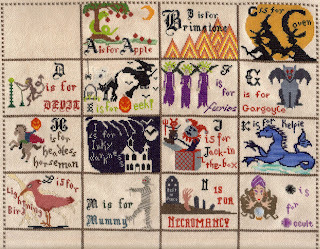 Trick or Treat is on my 12 in '12 list and I have the fabric. Maybe just one little weekend. What a shame February is such a short month! For Jardin I also stitched a Birthday card from WOCS for a member of the Needlecraft Haven featuring a February violet. I can’t show that one until the Birthday Gal has received it. Speaking of Birthday Gals, it was Mouse’s Birthday this month so I stitched her a little Margaret Sherry design featuring, what else, but two little mice stitching a picture. I used my delicious fruit tea dyed evenweave. I used two bags of Echinacea and Raspberry tea and soaked the fabric for quite some time. That is a technical term for “I’ve forgotten how long but it was a while”. The smell while I stitched was amazing! I don’t know if it lasted until Mouse received the card, I hope so. I used some lovely De Havilland silk for the purple and an Oliver Twist for the pink. This was slightly variegated and lovely to stitch with. The needle is, of course, a gold needle. Only the best for these mice. The design is a freebie from the Cross Stitcher website found here. 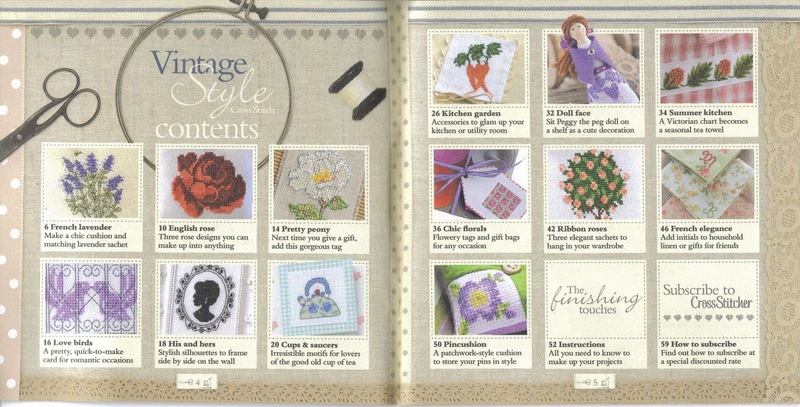 Please note, that link takes you to the magazine freebie page but the Margaret Sherry designs are ONLY available to subscribers via the special Craft Circle pages. Sorry! 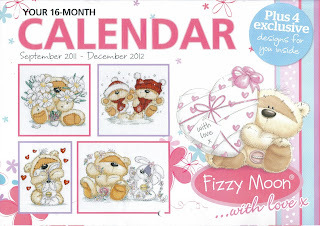 There are some lovely freebies on the page I've linked to make up for it. 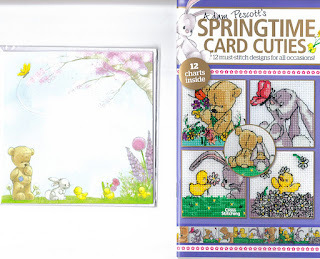 This was the January Monthly Freebie Challenge chosen by Christine on the Needlecraft Haven board. The original blog Les Chroniques de Frimousse showed several difference colourways but all three of the finishes so far chose the blue and yellow. Great minds stitch alike! I used some scraps to make some extra snowflakes and scrapbooked it with some silver snowflakes too. It is currently on display in my box frame but will go into the book when I complete the February Challenge. I added the Russian for Happy New Year myself. At least I hope that's what it says and not "Potato Soup". The Large Boy's Russian classmate was on holiday that week so I couldn't even check with her. The more eagle-eyed of you may have spotted my followers have multiplied to over 200 now! I decided to have another Secret Giveaway for the monumentous event. I went through the last 200 comments on my Dashboard and tallied up how many times each person had commented. (Fun Things Statisticians Do In Their Free Time No 95). is the lucky winner of the Secret Surprise Giveaway! If you pop over to Christine's blog using the above link you will see her version of the Russian Doll. I'll be sending a little something to you very soon Christine, so look out for an email asking for your address. Finally, don’t forget the Secret Stitching Sweetheart activity for Valentines Day. 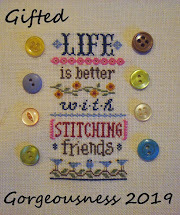 Email me your stitched pics by 10th February to join in the fun. More details here. Blue for you, blog sharing and a Serendipitous find. I very successfully tea-dyed some fabric using fruit tea recently and had a look round the kitchen to see what else there was. Not a fat lot in my kitchen TBH but there was some food dye in blue and red. Hmmmm, blue food dye - that might work. I dumped a bit (maybe a teaspoon?) into a bowl and popped a scrap of random white evenweave in there too. Swirled it around, pulled it out, put it back and repeated every so often until 9pm then I left it until bedtime and put it on the kitchen roll to dry. In the morning a nice pale blue colour, perfect for a snowflake. 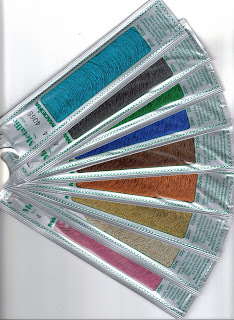 And if I feel tired when I'm stitching I can just lick the fabric and get a blue-dye rush! Have you ever seen a kid high on blue dye? The large boy had a Thomas the Tank Engine cake one year - hyper hyper city! I've mostly been stitching on A Dark Alphabet by A Company of Friends this week. I've nearly finished "Q" which is fantastic, she's a Queen of the Night. I love her and will post a pic soon. I haven't got so much done during the day as the Small Boy has discovered the art of communicating his hunger via dragging Mummy into the kitchen and positioning her in front of the relevant cupboard for cereal, fruit or drink depending on his wants. I have been mailing out my Giveaway prizes, two people haven't responded with addresses yet. Blue Star Stitcher and Terri P but I think it may be a problem with AOL and Gmail as they're both on Gmail which seems to think AOL is spam. I've got a new gmail address now so I'll try again. I bit the bullet and subscribed to Cross Stitch Collection again. They will be featuring the Joan Elliott Garden Fairies every other month this year so that would cost me 6 x £5. Or I can subscribe for £11.39 a quarter and get 13 magazines. The 7 without Joan's fairies may well have something equally nice or they may find themselves Ebayed or Giveawayed on here! If you see anything you like the look of on my Mag Contents page in the forthcoming months let me know and I'll either send you mine or get another one. As there isn't much stitching this post I thought I'd share two blogs. The first is this one Whole World Biscornu. It's in Russian, but we all speak a little Russian don't we? If not then there's an English part to each post as well as the Translate button. The project is to share biscornu themed by various different countries. They are wonderful, I love the Great Britain one in blackwork and there's a cute one with cups of tea and Sherlock Holmeses round the edge. The second one is christmas ornament sally earround Oh no, wrong spacing - its christmas ornaments all year round! Anyway, most months have a theme and you stitch and post something for that theme. February is Christmas Trees. Well, having found that ancient old UFO of a tree and then receiving a delightful little Prairie School tree from Kathy Ellen as a little bonus with my 12 Days of Christmas prize I couldn't ignore the message from the Stitching Gods. I must join Christmas All Year Round! The results of the Just Nan poll are in. People are in two camps - the Enablers who say just one or two pieces before I buy Snow Flowers and the Stash Police who say I have to stitch the biggest one before I buy any more. And then there was Ewa, Queen of the Enablers who said "None, break some rules!" I hate posts without pictures! So here's a random Chinese Dragon for the New Year. 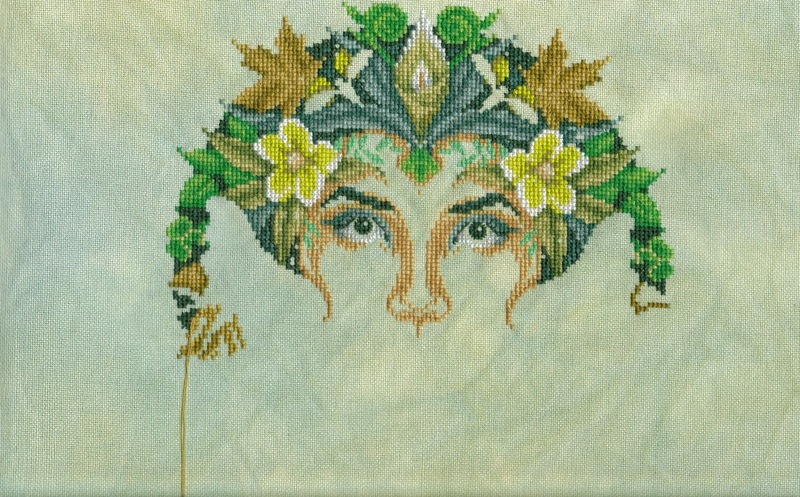 Stitched way back when I used aida for large projects. I've always liked the bamboo effect frame on this one and the metallic details too. Neither of which can be seen in this photo! Here it is, my very first official TUSAL post. I first discovered the TUSAL a year ago when I was a mere blog-stalker. I was determined to take part this year and share the fun so I started a blog of my own. Here we are several months later with a loyal following and a folder full of photos. I'm having a little break from GG as I now have five letters of the Dark Alphabet and three Round Robins to stitch! Two of the RRs are mine so there's no deadline really. The rainbow band sampler has "been around the world i, i, i" (apologies to Lisa Stansfield!) and now just needs the red band to finish it. I charted the red part months ago and had to rummage to find it today. Surprisingly it was in a safe and sensible place! The other "my" RR is the Joan Elliott Flower Fairies, I have to stitch the centre of this one while the other 6 stitchers will each do a Fairy. The final RR is Kathy's Just Nan sampler which is lovely but I haven't even chosen my bands yet! IHSW was, as usual, less stitchy than normal. The bizarre thing is, I sign up every month for it and every month something comes up. Either I have a rare night out, or I have to work, or one of the boys stays awake. Either way IHSW never seems to coincide with alot of stitching! I spent Saturday at work and most of Sunday scrapbooking my smalls and making a prize. Saturday evening I was so tired I did half a blog post and a small amount of "P", Sunday some more "P". Just wanted to say Calamity Jr aka MJ is so happy with all the complimentary comments you left about her work so Thank You for being as lovely as I expected you all would be. Finally, Valentine's Day is looking fab already! The signups are growing and the pictures are rolling in already. For more details see this post. As promised, here is a fun online activity for Valentine's Day. It's really very simple, all you have to do is email me a picture of something you have stitched which is suitable for Valentine's Day. It could be a heart, or a pair of cute creatures, or the word "love" or anything which warms your heart. It can be something you've stitched in the past or something you've made especially for this year. If you'd like to be involved then leave a comment on this post, I'll be putting little reminders up from time to time and will email on 9th February to make sure you send the pic in time. We managed 24 people taking part in the Advent Calendar which was such great fun, I'm sure this will be too. 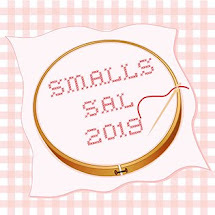 If you don't have anything already stitched then Cyberstitchers have some nice freebies (San Man's are good) or try Google Images for "grilles gratuites coeur". The French seem to excel at beautiful hearts. If you'd like to make a link on your blog to this post, please help yourself to my Heather Holland-Daly Heart at the top of this post. Sending Lots of Love out and hoping to get some back!! As well as the 7 Epiphany Giveaways I also had a secret surprise giveaway going on behind the scenes. I like to look at the stats page on my dashboard and see where everyone is coming from. I was so pleased that in December I had nearly 4,000 hits thanks to the Advent Calendar activity! Anyway I looked at my comments list and saw I was nearly upto 1,000 comments. I've been keeping an eye open and the 1,000th comment was made by Calamity Jr (aka Mary Jane). She will be receiving a special gift in the (near) future. "I can't say when I started stitching, since it seems like it's been forever. I started with crewel embroidery probably in junior high, which was a very long time ago, haha. Somewhere I learned about counted cross stitch, and it became my number one needlework love. For awhile I had a stall in a craft mall, where I sold a few cross stitched items (no way to make back what you put into them, though) along with hand painted things, like sweatshirts and address book covers. When there was a LNS near, I stitched quite a few of their display pieces, and it was always fun to go in and see my work on their walls. Until recently I have stitched mostly larger, framed designs, and most often as gifts. However, since I've discovered the world wide community of bloggers who also prefer to live with needle in hand, I've managed a few smalls and even kept some for my own home! On the personal side, I met my husband in January of our senior year in high school, married 3 1/2 years later, and we've been blessed with one amazing daughter, Jen, who's in school in Kansas City, MO. (I won't get started there; it would take too much typing and I always pop buttons because I'm so darn proud of her.) We have a 5 1/2 year old golden doodle (golden retriever and standard poodle mix) who is a great buddy and who keeps me exercised, since he really likes his daily walks. I work in a dental office very close to home, which is great because I get home for lunch with my "boys" every day. I do all the office type work - phones, scheduling, insurance, checking people in and out, etc. And that's me - Calamity Jr aka Mary Jane or MJ." This last one is on my "To Do" list for the large boy because we say it to each other all the time! I hope you all found that as interesting as I did, it's great to learn more about your followers. And I'm not at all worried about stitching something now! Nothing like stitching for a semi-pro to make you feel nervous at all! I must remember to give Thanks to Daffycat for the idea of a secret giveaway, I think it's such fun because it's rewarding the people who comment anyway. If any more of my non-blogging followers would like to share their stitching (and life stories) here please send me some pics and info. It's so great to meet you all and find out more about you. Basically I'm just really nosey. I saw these completed on someone's blog over Christmas. I started these years ago (mid 1990s) and have stalled slightly as you can see. The trouble is I just didn't feel like stitching on them at any other time than December! Here's a close up of the "L". Please do NOT click on the pic and look at the hardanger! Hopefully that has improved in the intervening years! This one is a total mystery. I can't even remember starting it. There is no thread, just a photocopy of a chart, a scrap of blue aida and a display hoop. There is a clue to the age as there is a price list for Barbie clothing which I bought as a Christmas present for a friend's 7 year old daughter. She must be at least 26 now! Luckily the threads listed are all DMC so I can easily finish it. Mini competition (no prize, just a feeling of being old but clever) - can you identify the shop the bag belongs to? The kit didn't come from that shop, it's just been stored in it for at least 17 years. Clue - they were proud that most of their produce was Made in Britain. And finally, here's a little scrapbooked finish. A Gazette 94 freebie for the New Year. Cute as ever from Claire. Stitched on 28 count green evenweave. The "scrapbook" finish is deliberately very simple. I do not want to "over egg" these designs as I am inclined to do sometimes! edited to add: The oldest UFO is hosted by Evalina here. I have to post on the last day of every month (if I've stitched on them that month). Oh goody, another date to remember LOL. As part of the 12 Days of Christmas in Blogland activity organised by Evalina, I had not one, but seven Giveaways on the same day - Epiphany. So that didn't make the draw complicated at all! I used the untechnical method of putting all the names in a cup and getting the large boy to pull them out. I was so flattered by the number of people who wanted the stitched ornie, especially given my self-proclaimed lack of finishing skills! So I've decided to invite everyone who entered Giveaway No 6 to send me an email with their Birthdate and address so I can send them a card on their special day. You know who you are, send me the details! The booklets, kit and metallics will be posted out after the 20th (payday!) and the two stitched pieces sometime this year hahaha. Thank you to everyone who entered. The second part of this post is dedicated to Theme-a-licious, Jardin January. Hosted by Heather, click on the above link for details. I'm "rounding" her face out with fractionals. My Mum saw the piece and didn't like the "stepped" look using whole stitches. It's one of my only criticisms of Joan's work, her skin is often "stepped" and blocky. I much prefer Nora Corbett's limbs!! This also fits in with the Jardin theme. It was actually stitched in December for a Birthday Card Exchange. We received the list of Birthdays on 20th December and the first one was on January 1st!! So I had to work extra quick to get this one out on time. It's a method I've used before, just stitch the backstitch then colour in the shading with felt-tipped pens. The design is from WOCS, part of their Year of Flowers. I've used aida because it's easy to colour. Bit of confusion on my part. I signed up for both WIPocalypse and TUSAL noting that you had to post on moondates. What I didn't spot is that WIPocalypse is on Full Moons and TUSAL is New Moons. So opposite ends of the month and two dates to remember!! I started stitching her back in September 2011 almost as soon as I got the book-a-zine she was in. The fabric is a piece of 32 count Murano dyed specially for me by Crafty Kitten (Hi to Dawn and her new Christmas Day baby!). I'm using all the recommended DMC colours because Joan just picks the best combinations, I feel there is no need to change anything! The face will be filled in but I only have half a skein of that colour and I'm paranoid of running out halfway through and getting a different dye batch so it will wait until I order some more threads (after payday). Neither of these have been stitched this year so far. I am a OAAT gal at heart and enjoy my stitching most when I can keep on with a project until it's done. Rotating is not really for me, I tried various forms last year and it didn't really do it for me. As you can see it's a TUSAL dish at the moment and the jar is empty. I put my ORTS in the dish besides the sofa and empty them into the jar periodically. There doesn't seem to be much in there and it is mostly yellow, as I frogged one shade and replaced with another for the Needlecraft Haven freebie. I think I must have emptied some of 2012's into 2011's jar as there is no red at all and I know I stitched red this year! "I think I would probably be the rice stitch - complex at first glance, but honestly quite simple underneath. :)"
So the Travelling Pattern is off on it's travels again, back to America. I have to Google the address Measi gave me as I have no idea where in America it is going to!! Well, actually I'm having a Giveaway for Epiphany! This is part of Evalina's 12 Days of Christmas in Blogland activity. January 6th is the Twelfth Day of Christmas the day the Kings/Wise Men came to visit Baby Jesus and give him gifts. So here they are, bearing gifts for my followers. Now, my Wise Men here, please! Now Kings: Sidney, Neville, Cliff and Nikolas Anoniodes.Four Kings, I'm afraid. We happen to have four lovely crowns, so it seemed a pity not to use them.Sidney, put your crown on straight please, not over one eye. What have you got under your jersey? That's not the place for a hamster, is it. Put him straight back in his little pen, please. 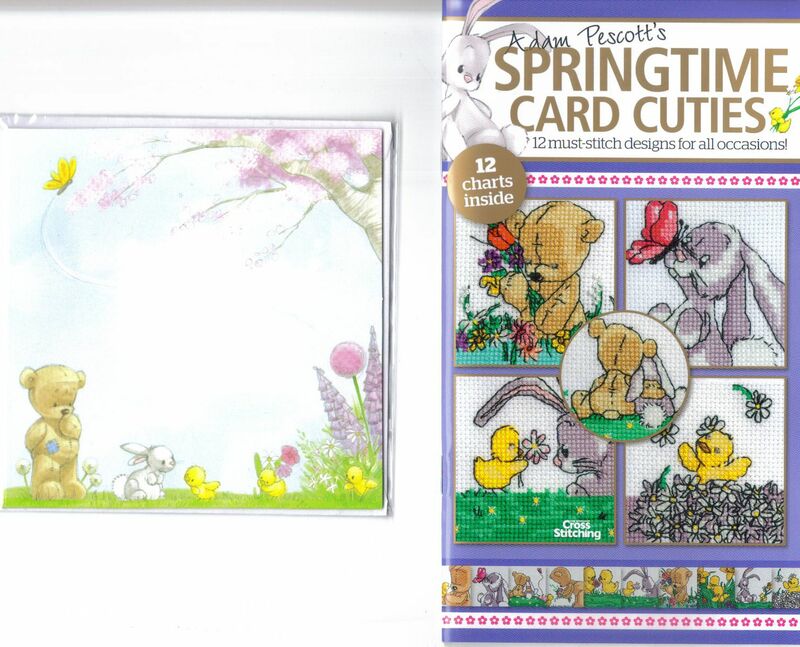 Draw Number 1 is this booklet of Springtime designs plus 2 cards and envelopes. 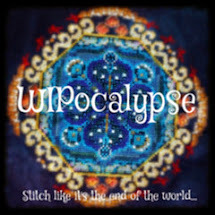 It was a cover gift with World of Cross Stitching magazine. 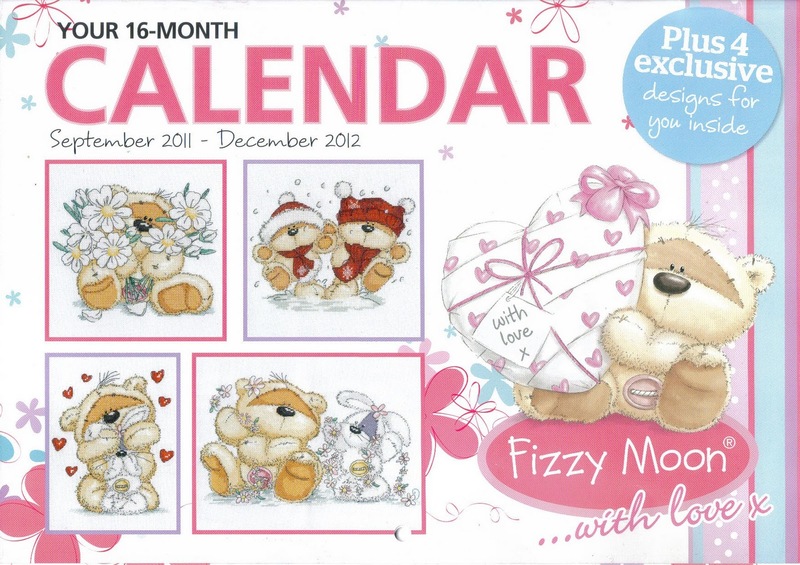 Draw Number 2 is a Fizzy Moon Calendar for 2012 which includes four exclusive cute charts as pictured on the front cover. Draw Number 3 is this booklet of vintage designs. 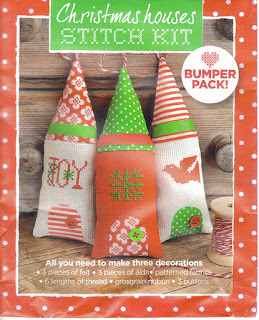 It was a cover gift with Cross Stitcher magazine and I was really looking forward to this until I realised all the designs had already been in the magazine! However if you haven't got this mag where you live it is a lovely prize. Draw Number 4 is a set of Christmas House ornaments. The kit includes material, aida, felt, ribbon, buttons and threads (which are not DMC or Anchor and you may want to sub them!). I've seen these stitched up and they are rather nice, but I don't do the whole sewing thing! I will include the instructions on how to make them up too. Draw Number 5 is a selection of Madeira Metallics. I won these for having a letter printed in a magazine but I already have alot of DMC metallics so I would rather these went to a good home. Draw Number 6 is a "Stitching Friends" ornie stitched by my own fair hands. Here is a similar one, but your's will be in blue. And the corners will match! 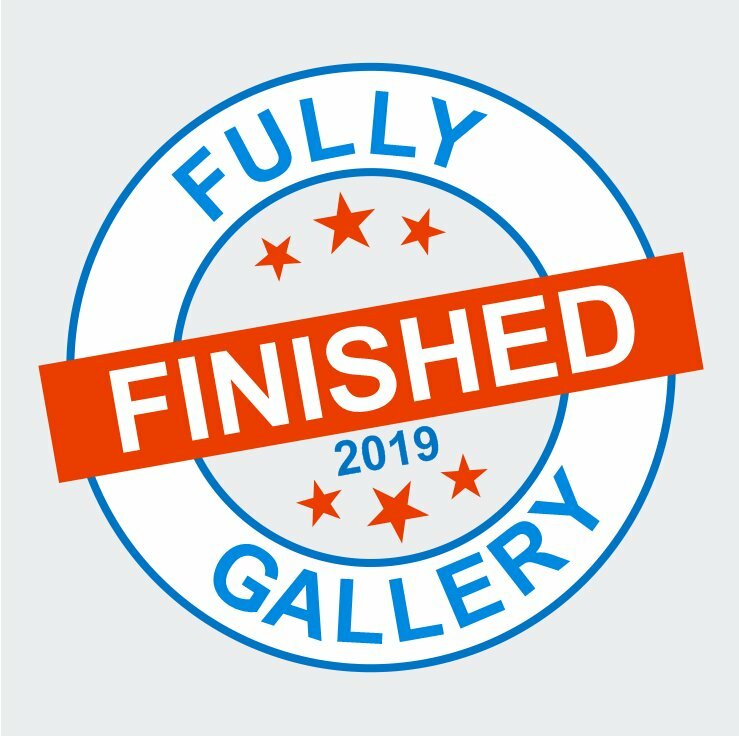 The final Draw Number 7 is just for Quilters. The San Man Originals Forum has had a New Year makeover and there are the cutest little shop designs there. I am desperate to stitch the Quilt Shop for someone but I don't know any quilters! So if you quilt (and have blog evidence to prove it!) then this is for you. No pic because it is copyright to San Man. Which draws you would like to enter. You can enter all or some of them but you must be a quilter to enter Draw 7. Or have a mother/sister/aunt/partner/relative who quilts that you will gift the prize to. Please tell me who this is in your comment.